It’s the sound of a pledge-free day. And you have Sustaining Members to thank for it. Our September Membership Drive is shorter than past drives due to the fact that listeners in droves have flocked to Sustaining Membership as an easy and convenient way to support VPR. At the end of June, VPR had over 11,000 Sustainers. That’s up from 8,600 last year. In fact, over the past five years, we’ve experienced a 117% growth in the number of people who support VPR on a monthly basis. Budget your support of VPR with a manageable amount each month. Our average, Sustainers give $14 a month. Sustainers are automatically included in all of the membership drive drawings we have each year, increasing your chances of winning airline tickets, iPads, gift certificates, and more. As a Sustaining Member, you’ll receive a special VPR euro sticker letting others know that you’re a Sustainer! Once you setup your Sustaining Membership, donations happen automatically through your checking account or via a credit card of your choice. VPR holds special receptions for Sustaining Members, often before a concert or other performance in the region. Your membership in VPR is always current! Periodically, we are able to let Sustainers in on special offers from arts presenters for discounts on tickets. Enjoy more programming and less fundraising today thanks to all of our Sustaining Members! 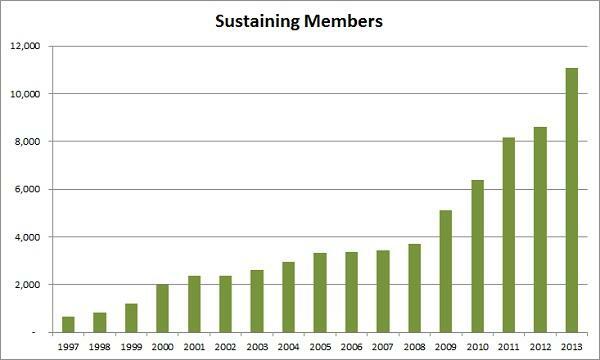 And if you like what you are hearing (or not hearing) today, why not become a Sustaining Member yourself? With more and more Sustaining Members, our membership drive goals can be lower and the number of days we spend fundraising on the air can be shorter. That’s something we can all get behind. You can help keep our membership drives as short as possible by becoming a Sustaining Member of VPR today! Our September Membership Drive is off to a strong start! Although we missed a challenge of receiving 150 pledges before 9 a.m. (we received 130!) our faithful listeners came through in a big way, contributing nearly $10,000.